 Yes you can use http://www.pbinsight.com/support/product-downloads/item/windowhelper for this support. It’s a good tool go and download it. I just think it should be built in. 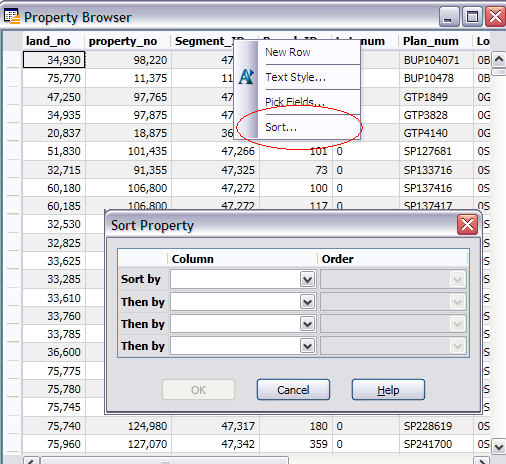 As promised in my comments this is an update to reflect the new header click sorting in MapInfo Professional 11.03. The 11.03 patch has added header based sorting, and while the sorting works as expected which is good, there is something a little odd. What is the typical sort pattern? Left click header, table sorts ascending click again and table sorts descending or vice versa. Then you normally have any extra sorting stuff in the right-click menu e.g Sort Ascending, Sort Desending, Clear Sort etc. Go into MapInfo 11.03 left click header, context menu appears 0_o… I’m not aware of any program that has ever done that. A menu on left click is not normal, even crappy ol’ Lotus Notes doesn’t have a menu on left click and Lotus Notes is one really crappy program. P.S Don’t talk about your new feature i.e the browser, following normal conventions for browser style windows then do something no one has ever done….and still no shift click block select. MapInfo Pro V 11 Browser will have full right click sort and filter in patch release, scheduled for December. You can select block by click and drag or use Ctrl select for none contiguous records. There is a MapBasic tool free to download called Window Helper that allows docking of windows. If promoting QGIS then fair play, but you don’t have to inaccurately bash MapInfo pro to do it. A patch really? Is this mentioned anywhere public? How about they do it in the first release and then it might have been worth the hype they did for the release. Patches are for bug fixes not adding missing features that should have been there to start. Click drag is not the same speed wise as selecting row one and scrolling though to a random number and holding shift then click to select the whole block. I know about the free tool for docking windows, I know the guy from PBBI that wrote it and he borrowed some of the code I used in my dock mapbasic tool, but why relay on a Mapbasic tool when it should be built in. I’m not bashing MapInfo, I’m just stating the facts as I see it. If the patch in December changes things, then I will happily review my post. Ok, Firstly the patch releases are common knowledge as far as I know, they were talked about at the official launch at the user group and its in the “official” PBBI launch PowerPoint. As I understand it the code simply wasn’t ready in time for the June launch date, so rather that force users to wait another 12 months for the next full release they are including it in a patch. I take you’re point on the click select, one good thing here is the “Suggest Product Enhancements” which are read and noted, as I know the guy that collates them all;. if you don’t like something, suggest it, it works. I am currently passing the tool around the users I know as it is so useful , I suspect that the release of the tool is a step before full inclusion. That’s fine. When the patch comes out I will review the post. I have no problem doing that, it’s only fair game. I am not a MapInfo user and have no desire to “bash” anyone, but…. 6 months? for a patch release? Hmm. Better than the patch for ESRI we’re still waiting for so that we can delete columns from a shapefile. Nathan I agree with your comments – why does it take a patch that is months away. Have have been using MapInfo 11 and are quite disappointed. I tend to frustrated with it and either use QGIS which is becoming a valid GIS in a production environment (on a corporate level) or ArcGIS. The days where commercial software was the innovator have long gone. Good post and worthy rants – hope the feedback gets to PBBI mapinfo asap. > If promoting QGIS then fair play, but you don’t have to inaccurately bash MapInfo pro to do it. This is a valid question: If they can do continuous selection by click and drag why on earth can’t they do Shift-click? And after all these years why are the fundamentals of the Mapinfo GUI still so bad that people have to find addons to sort it out? I can’t see MapInfo pushing hard… the last couple of releases have had a few minor changes which greatly improved the usability, but they’re hardly catching up to QGIS in that area. And their main trouble is that Mapinfo can’t actually do much without buying a bunch of addons as well. Unless they start giving away these addons or something I can’t really see them competing in terms of features. But then, maybe they don’t care – they seem to focus on the big organisations with clueless corporate IT departments that are sucked in by marketing buzz-words and would never dream they could use a free product. First: At the top you took the time to (justifiably) criticize the old MapInfo browser for keyboard navigation, keyboard gestures, and “ugly.” Given that, I think it’s only fair to acknowledge that the new browser does make improvements in those 3 areas. Ctrl-backspace while cell editing, arrow key navigation, etc. Second: 27,000 rows is pretty wimpy for what some users do. The new Pro browser seems to be the same speed with half a million rows as it is with smaller tables. Have you tried larger tables with QGIS? I wouldn’t be surprised if that live scrolling might require QGIS to have all the data in memory, and that might not work so well for much larger tables. Just a semi-educated guess. 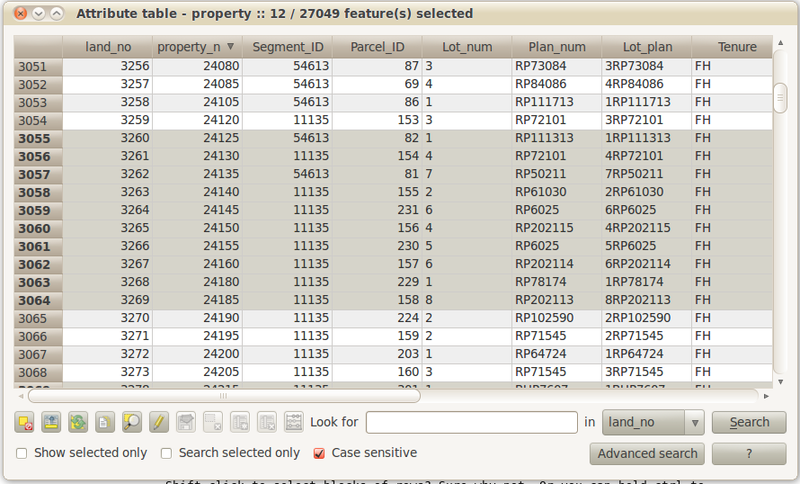 But, overall: yeah, the new MapInfo browser feels incomplete, and I would hope for something in a maintenance release. I haven’t read anything about that yet, but it’s early; v 11 just came out. I agree, shift-click in particular should be added, I’m just not sure what the best channel is to communicate that request, to maximize the chances of it being done for the next MapInfo maintenance release. This is true that area is better then the other one. I know 27000 rows is pretty weak. I just tried QGIS with a table with 270000 rows (on a slower machine then the post) and the resize speed was the same. I will follow though with more testing. Has application war and mass advertising drop down so low … to compare tables ? Some of us care about performance and productivity. > Some of us care about performance and productivity. MapInfo is still using the same d-base/ C+ / MapBasic engine since it came out in 32-bit (and THAT was based exactly on the old 16-bit engine). They’ve had 20 years on Windows and the program remains stuck with the limitations of the old dogs from which is was whelped. What should have long been standard inclusions to address shortcomings in the product, remain expensive add-ons. It remains materially the same “desktop mapper” as it was in 1992. I’ve loved MapInfo since DOS days, but the program is condemned to wallow in the early 90’s with ill-thought feature additions, and half-ar53d long-overdue attempts to correct early dodgy design shortcomings. So long as the company remains focused on sales, rather than focused on producing great software that remains conceptually up to speed with the rest of the IT world, they will become more and more of an anachronism, eventually to be killed off by shareware. They need to get some eager creative bright young guns into their product development team, and have them led by someone under 35 with a bit of vision to put some bark and bite back into this old dog. Until then our cash is spent on better things than MapInfo 1.1 – sorry, 11.
seems they spent more time on the marketing blurb than the product.